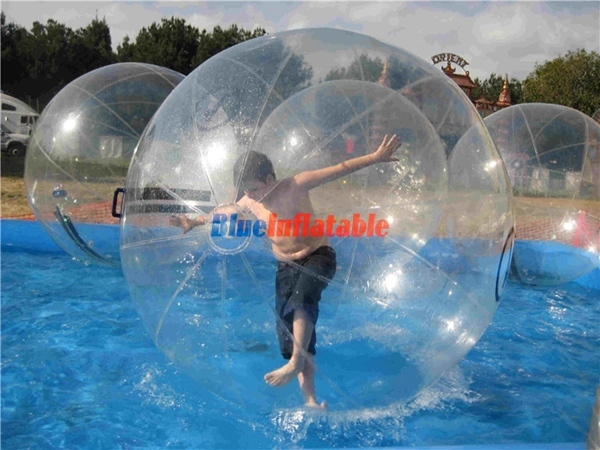 Water balls are large inflatable balls that enables someone inside it to walk or run across the water body surface. It is made of one thick layer, which is also transparent thus enables light to get through it freely. This ball is approximately 2 meters in diameter, with an entrance that gives access into and out of the ball. This ball is specifically made for movement on water bodies. This is why it has been and is still being used by both children and adults at swimming pools, lakes, beaches, and marinas, to mention but a few. Like many other inflatable products, water balls are commonly manufactured from Polyvinyl Chloride (PVC), Thermoplastic Polyurethane (TPU) or a combination of TPU and PVC. However, TPU balls are more expensive than PVC due to its extraordinary features like durability and high tensile strength. These balls come in different sizes and colors depending on your choice. Much as it is safe by its construction standards, there are still some safety concerns of using water balls on large water bodies like sea or lakes. For that reason, it is recommended to use safe confined-shallow water bodies at most 2 feet deep like the swimming pools. It is also recommended to play under supervision by trained personnel or staff. Nonetheless, you can still use large natural water bodies so long as you are under constant supervision. It is generally easy to use a water ball on water. All you need is the water ball, an air pump or blower and a water body. After entering the ball, it will be closed and then inflated using an air pump or blower. This will increase its size, making it easier to control while inside. At this point, all you will be required to do is walk or run in the direction you want while in the ball.